The Silly Season Is Officially Over. Time for Brunch! 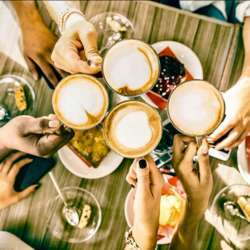 You must be a member of the Brisbane Coffee & Brunch Group to attend this activity. Would you like to join this group? Allow me to introduce myself. My name is Angela, and I put up my hand as Consul for this group so that great conversations over coffee and brunch remain part of Brisbane's InterNations community. I look forward to getting to know you and finding out about your suggestions for new brunch spots we can explore and/or for some that already come with a your recommendation. Protected content was my first pick as we don't have to put a limit on numbers. They also have lots of parking, are close to public transport and have a menu that caters for food preferences and intolerances. so everyone should be able to find something they can enjoy. The plan is simple: Come at 11 am, bring yourself and meet with people who like to chat over brunch and a cup of coffee (or tea, of course).